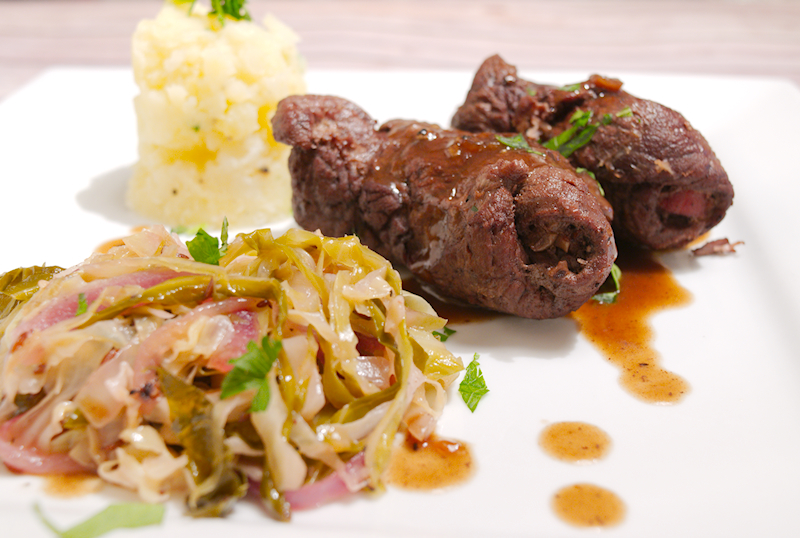 A delicious recipe for the traditional German beef Rouladen. 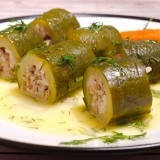 Hearty beef rolls stuffed with onion, lardons and pickles in a rich sauce. I was in Germany last week for a business trip. I always enjoy visiting Germany, especially in the summer when the weather is quite pleasant. Besides the business, the main reason I went there was the food! I love German food, these people know how to eat well. 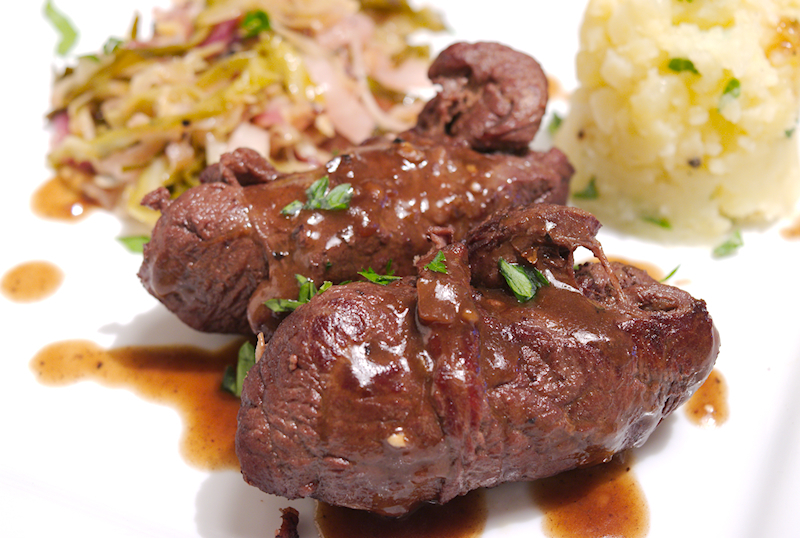 From the local sausages to accompany your lovely and cold Pilsner to hearty Sauerbraten, a slowly-cooked and delicious meat stew. And what about the bread? Oh, just delicious! Even the simple and cheap Pretzels are a treat for the palate. I visited a restaurant during my visit and had the chance to try the famous beef Rouladen. That was it! I was in heaven. A roll of good quality beef stuffed with onions, lardons and gherkins. It’s a kind of a stew cooked in a lovely and rich brown sauce. I had to learn how to do it and share it with you. 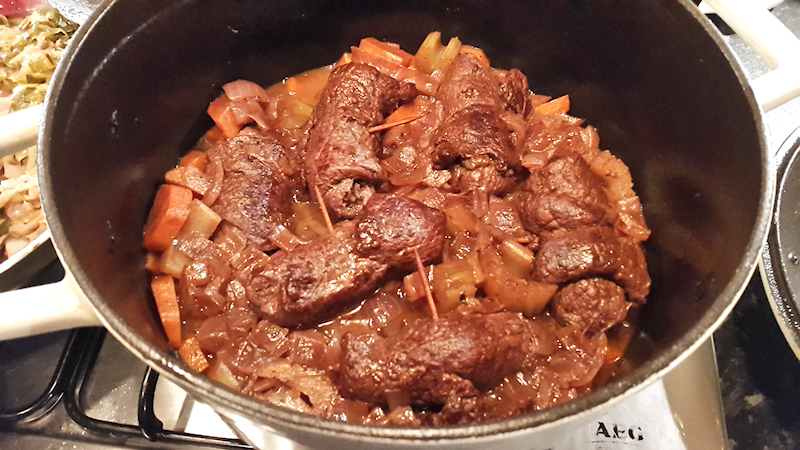 Beef Rouladen takes some effort to prepare but the result is very satisfying. 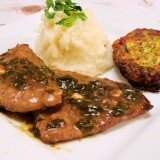 The Germans cook it at home for special occasions or when they want to treat their family with something special. It’s a bit heavy but it really does worth the risk! 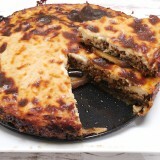 You can serve it with mashed or crashed potatoes or even some braised cabbage. Just dip into the fine German cuisine and you will be rewarded! 6 slices of top round beef. 2 carrots cut in thick pieces. 1 large red onion coarsely chopped. 1 yellow onion finely chopped. 200 gr (7 oz) smoked lardons. 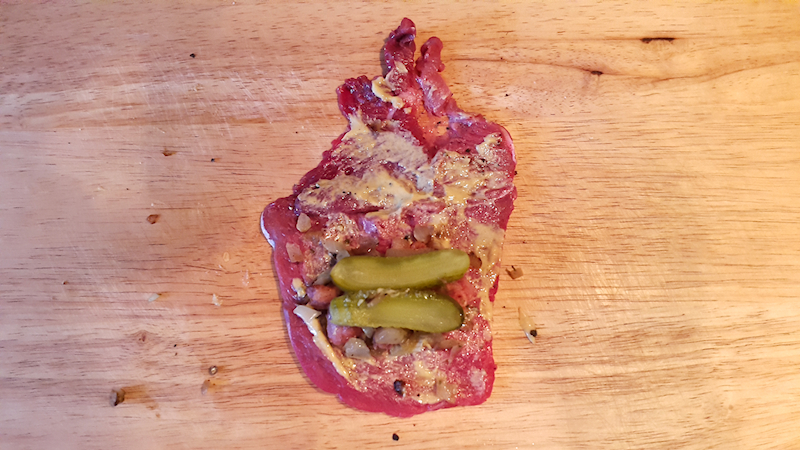 3 cornichons (gherkins) cut lengthwise in half. 1 cup of extra-virgin olive oil. Add 1-2 tablespoons of olive oil in a frying pan and fry the yellow onion at medium heat until they start getting brown. Add the lardons in a frying pan and fry them (without any oil or other fat) at medium heat until they start becoming crispy. Place the beef fillets on your working bench and cover them with cling film. Use a rolling pin and roll them like a dough until them become quite thin (a couple of times will be enough). Use one of your fillets and season with salt and pepper. Spread one teaspoon of Dijon mustard on top. Add close to one side of the fillet a tablespoon of fried yellow onion, a tablespoon of fried lardons and 1 piece of cornichons. 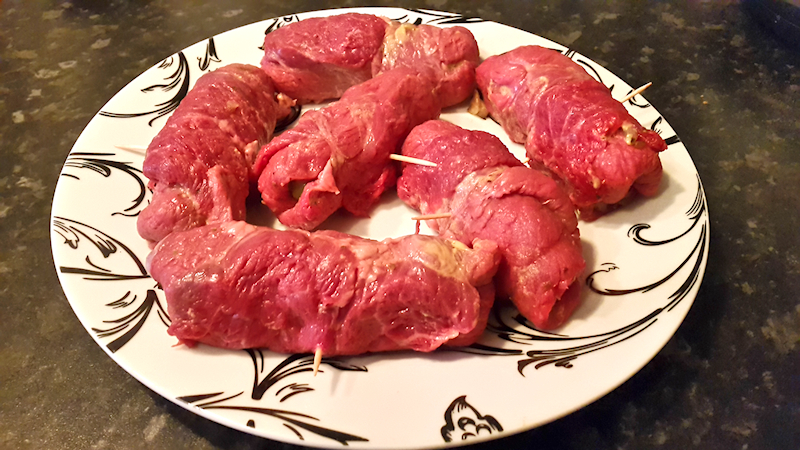 Fold slightly the sides and roll the beef fillet like a Dolma, making sure the edges are sealed. 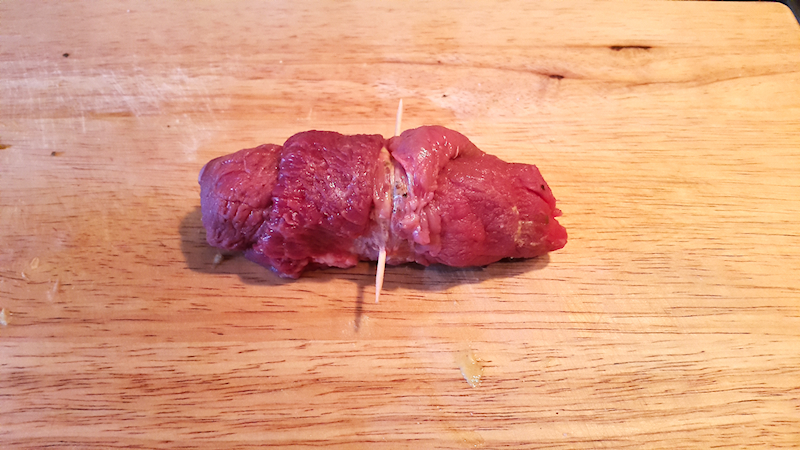 Secure the beef roll with a toothpick so it doesn't open during cooking. Set aside and repeat with the others. Add the rest of the olive oil in a large and deep pot or Dutch oven and heat it up at medium heat. Add the beef rolls and cook them until they get brown in both sides. When done, remove them from the pot and set aside. 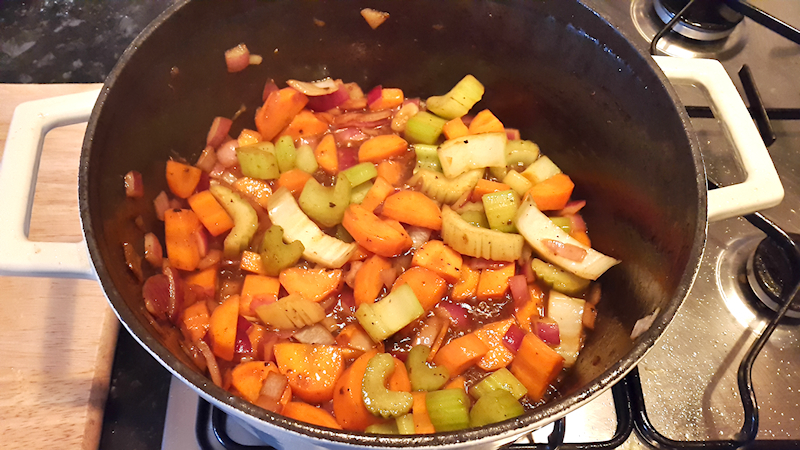 Add the carrots, celery and red onion in the same pot and cook them using the same oil at medium heat for 3-4 minutes. 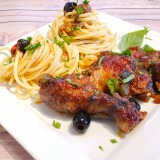 Use a wooden spoon and scratch gently the bottom of the pot to release the flavors of the fried meat. Season with salt and pepper and add the red wine. Bring it to boil, let it cook for a couple of minutes and add the beef broth. 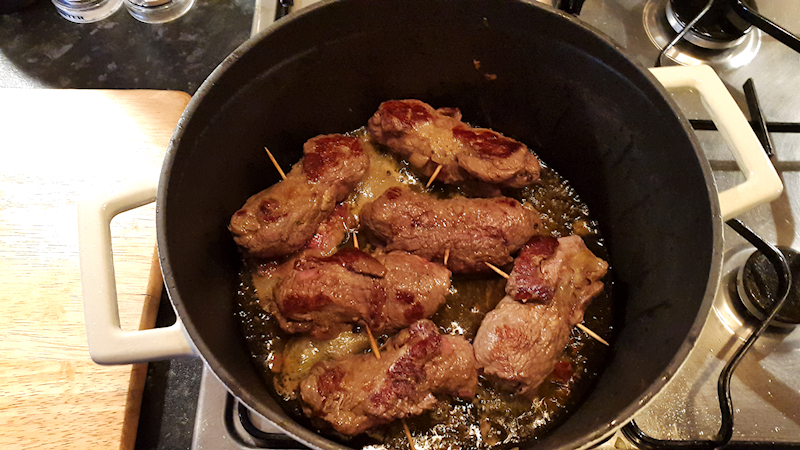 Place the beef rolls (together with their toothpicks) in the pot making sure they are covered by the juices. Bring it to boil, cover with a lid and place it in the oven for about 1 hour. 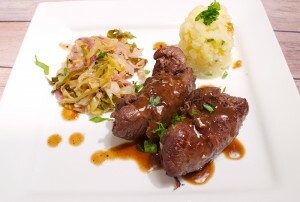 Enjoy your beef Rouladen with mashed potatoes and/or braised cabbage (Sauerkraut).